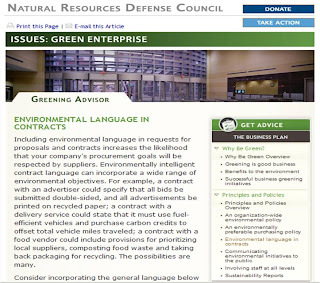 The National Resources Defense Council (NRDC) has created a Greening Advisor site for small and medium sized companies interested in greening their organization. "The Greening Advisor is a free and easily accessible resource that points the way towards cost savings and environmental responsibility,” said Frances Beinecke, president of NRDC. 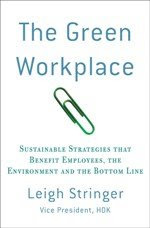 “With the Greening Advisor as a guide, greening a business or organization no longer needs to be a daunting task, but an achievable goal that can be integrated into every company’s mission." The site takes the next step for companies interested in developing their own committments and strategies for the environment by creating "boiler plate" policy documents as well as tactical strategies for going green. For example, environmental language in contracts, environmental purchasing policy and the like. I may have to steal a few of these!